During the week of Zooey Deschanel and Pat Morrison’s war of words over Downtown LA, two opportunities arose to experience the wonders of the metropolitan center of the city. The first was the Thrillist Bols Genever Punch Crawl on Wednesday night, and the second was the monthly Downtown Art Crawl. I did not attend the latter, but I did attend and thoroughly enjoyed the former. Six bars in Downtown LA offered up unique punchbowls mixed with Bols Genever. For $25 dollars, we got one glass of punch and culinary treats at each stop. I love grainy alcohols, I love discovering bars, and I love Downtown LA. It was quite a night. I consider myself pretty savvy about Downtown, as I worked in the Oviatt building on 6th and Olive for nearly a year. However, that was two years ago, and Downtown has since changed. There are more people and more places, and I view them as a very good thing. Of the six bars participating in the punch crawl, I had only been to two: Cole’s and Varnish. We started at Bar & Kitchen. 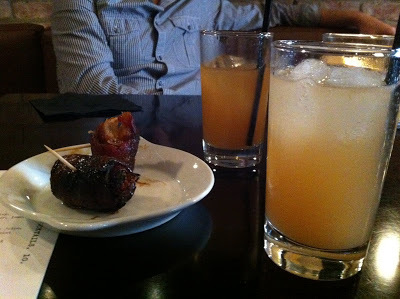 Their Vondlepark Punch was a refreshing mix of Genever and Amontillado Sherry, and they served us two delectable morsels of bacon-wrapped dates. The deliciousness of both the punch and dates had us drooling over the menu and vowing to go back in the near future for dinner. I also enjoyed the atmosphere of the place: unpretentious gastropubbiness with an East Coast feel. Next, we wandered over to the address of Caña Rum Bar: 714 West Olympic Boulevard, which happens to be the beautiful art deco Petroleum Building. We saw no sign or door for a bar, and were momentarily confused. We walked under the gorgeous archway into the beautifully-tiled lobby with two walls of old elevators framing a set of double glass doors. We told the security guard that we were looking for the rum bar. She directed us down a hallway (lined with historic photographs of Downtown) to the parking lot (adorned with stunning art deco light fixtures – yes, the parking lot! ), where there is a tent in the corner that serves as the entrance to Cana Rum Bar. Once inside, we saw that the double glass doors at the end of the Petroleum Building lobby lead to the bar. But they’re tinted and sealed, either to create a speakeasy atmosphere, to keep rum-filled drunks out of the lobby of the office building, or to provide easy access from car to bar back to car (such is Los Angeles). We sipped our Panamanian Detective, made with guava, Averna and limes. This was my husband’s favorite punch of the evening. I enjoyed it, though I really savored the scent of cigars from the Cigar Garden. Again, I vowed to go back for a specialty cocktail and a carefully-selected cigar from their humidor. I hope they have someone on hand to help me choose. Our third destination was Drago Centro, in the corporate City National Plaza. I typically avoid lounging in corporate atmospheres, but as we wandered around looking for the restaurant, I noticed that the plaza is designed to offer an elegant view of the Central Library, the West Lawn, the California Club Building, and the high rises ascending out of the landscaping of the Bunker Hill Steps. It’s really a lovely view, and made the experience of wandering around a corporate plaza actually inspiring. I felt like I was in a dynamic and alluring city, because, well, I was. 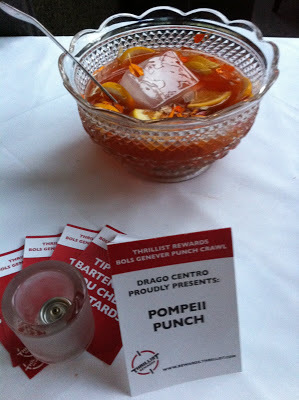 Drago Centro served up a Pompeii Punch accented with nastertium petals. 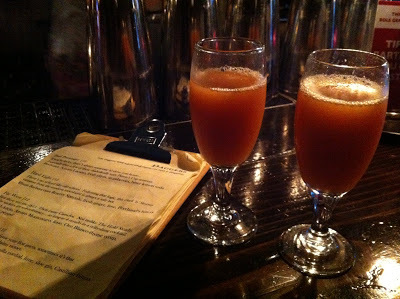 This was my favorite drink of the evening, as with each sip it revealed new interactions of flavor. They also cooked up a tasty fennel sausage pizza, which holds a place on their standard appetizer menu. I loved my drink, and I liked the snack, but because of the heavily corporate atmosphere of the restaurant itself, I probably won’t find myself there very often. Next up was The Falls. We have a friend who works there, and she showed us her newly acquired badass bartending skill of lighting her finger on fire and blowing the flame down the length of the bar. This trick was far more fascinating than their punch. Called Flowing Bols, it was altogether unremarkable. We had a great time there, though. Finally, we stepped into Cole’s for a Peach Cobbler punch, with cinnamon simple syrup and angostura bitters, served with a little side of baked peach cobbler. The pie was good, the punch was underwhelming. We were, when it came time, very ready to saunter back to Varnish, where the cocktails are always astounding. A charming gentleman named Chris welcomed us to the punch bowl and took great interest in describing to us his punch concoction, which he christened the Dutch Pugilist. He’d peeled dozens of lemons early that morning, dusted them with sugar, and let them sit for hours on end to create a zesty syrup that was the base of the punch. I remember it was wonderful, but I fail to remember details of its flavor (and failed to snap a pic), because at this point in the evening, I’d drunk a lot of punch. Chris charmed us with his love of libations and introduced us to a distant nephew of Maurice Chevalier, who wore a well-tailored suit and stood about 7 feet tall, no exaggeration. Drinking an old-English-named beverage in a 1920’s style speakeasy, and conversing with a relative of a vaudeville entertainer transported me to a very specific Los Angeles – one you wouldn’t think exists today. And yet, behind secret doors in Downtown’s historic buildings, it endures, this roaring Los Angeles. what a great blog, channing! How fantastic! LA is amazing, but add a dash of Channing, and it's outstanding! !